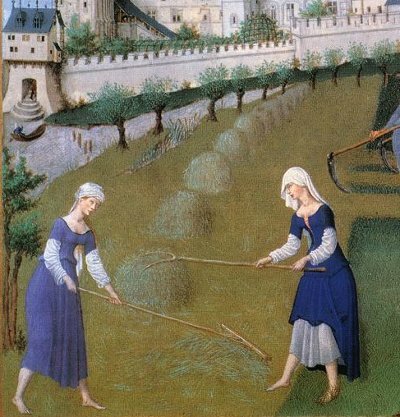 Pretty soon after beginning my life as a medievalist I realized that while wool is the most desirable material for finer clothes one also needs easily washable basic linen garments. 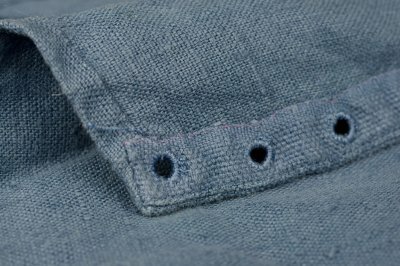 Unfortunately we are told that due to the period dying techniques linen only existed in somewhat dull colors. As I'm hopelessly vain, and not a purist my working / kitchen / camp kirtle was to be blue, though hopefully it may fade a bit in use. On the other hand, Thursfield does mention blue linen. I wanted the kirtle to be simple but fitted, so I cut it with the pattern of my woollen kirtle, adding generous seam allowances in case the linen wouldn't give in as much as wool. I also cut the curved front seam more straight. The linen happened to have quite neat and sturdy edges, which made good facings on the front edges. I began with them and worked the lacing holes before sewing other pieces on. Most of the lacing holes were made on a 18th century camp weekend, the wrong period but work itself works for both. 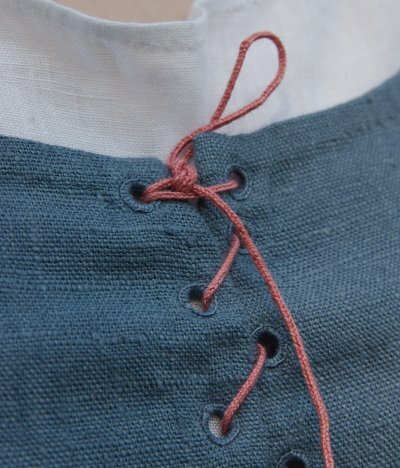 It might have been more appropriate for a modest linen kirtle to use natural colored linen thread for the lacing holes, but I used matching polyester thread neverthleless. Contrasting thread would have forced me to work more carefully, as uneven stiches would have annoyed me more, while the blue thread disguised them pretty well. I used the same logic in choosing a matching sewing thread. I had originally intended to make the kirtle quick and dirty and use hand finishing only in the most visible parts, but in the end I could not bring myself to use overlock for the seams but flat felled them by hand instead. I had already learned while making linen tunics for Jarno that flat felled seams in loosely wowen linen go actually quite fast after you've bothered to press them. The seam is also quite durable, especially as I used two rows of machine stitch in all the seams. I made the sleeves short so that the shirt sleeves could be easily rolled up. The shirt sleeves also add a bit of detail into a simple outfit. The lacing cord is, as usual, made with a lucet from a cotton thread that probably comes from my late Grandmother. At some point I considered adding some braid on the neck and sleeves, but then decided that it would fit ill on a plain working kirtle. A simple, hand finished dress looks in the end very suitable for the planned more mundane use (if one only excuses the bright color).